Listed in: Flowers, Party Planner, Photographers and Video categories. Get more for your wedding! 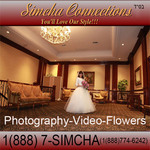 Don't forget to mention ChossonKallah.com when visiting Simcha Connections. Book a photo & video package and receive the entire bedekin set including flowers at no cost ($500 value).